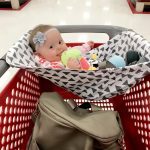 A shopping cart hammock for your baby. Are you serious? Genius. Pure Genius. Last month I was out grocery shopping with my Indy babe and her ginormous carseat. By the time our grocery list was complete Indy was surrounded by food, and I was playing tetris trying to make it all fit. I just kept thinking, “there has got to be a better way!” Well there is. A way better way. I came home and took to the internet, determined to find a solution or invent one myself. I found Binxy baby, and ordered a hammock immediately. Our hammock arrived in the mail and I made up reasons why I needed to go buy groceries right that instant. I got stopped seven times on my first outing- by mothers who were admiring our hammock and asking where they could get one. Every time we use our hammock I can count on getting stopped several times by admirers [of the hammock and Indy 😉 ], and mom’s who need a Binxy hammock in their life too. The fabric is thick and durable, the hammock is easy to use, and it fits most shopping carts. Yes, it does fit Target’s extra large shopping carts (I know you all were worried about that), you just put it at the front of the cart. It does not fit Costco’s carts, but those are like “the Shaquille O’Neal’s of shopping carts” per B. 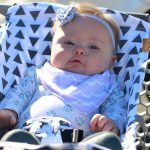 You can use it two ways- with your car seat on the hammock or just your baby in the hammock. Even more genius. Every mom could use a Binxy baby hammock. So tell your friends & go enter our giveaway! This is ingenious. 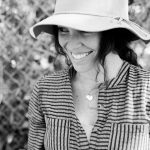 Terah, nothing stops you from finding solutions to challenges; and your generous spirit wants to share them with others. Indy Llew is so Blessed. This is awesome!! 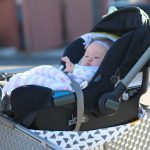 With a heavy baby, this would be a lifesaver shopping with three in tow! !